We’re no strangers to love… well at least we know that a whole lot of people in Rundle Mall are no strangers to it today – a bit of love from the Adelaide Flashmob. Today, Hindmarsh Square began teeming with life as people came together to receive the final instructions for what would be a brilliant event. The idea behind today’s event was to take the ‘rickroll’ meme and translate it into a live-action experience. This meant setting up situations where people would be interacting with one of the flashmobbers and being surprised by a group of people suddenly singing Rick Astley’s “Never Gonna Give You Up” and then quickly dispersing. 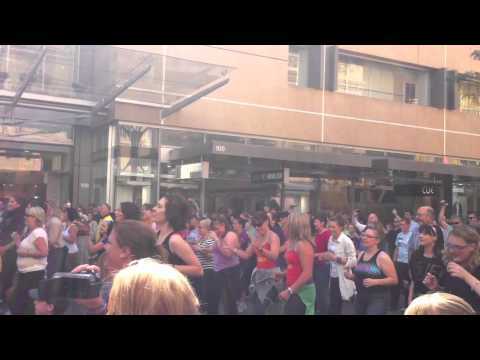 After a quick briefing and rehearsal, the Adelaide Flashmob split up and made their way to their first location – the Rundle Mall Canopy. Brave Barnaby was up first. His role as a ‘statue’ busker was perfectly performed with his very own milk crate, Rick Astley costume and a pair of fluffy dice. A sign reading “roll the dice for a surprise” hung around his neck, and it drew a bit of attention quite quickly. A soon as someone rolled the dice, Barnaby launched into song, and was then joined by the rest of the flashmob. The reactions were priceless, and Barnaby’s performance was spot on – even when he was being assaulted by a blow up doll. The next few activities involved flashmobbers Heidi and Leticha, then Chris and Dan asking people to take photos of them with iconic Rundle Mall sculptures. The trick here was that just as the people lined up to take their photo, the flashmobbers would burst into song! Due to the number of flashmobbers, we decided that going into shops would have been difficult – one for safety, and two because it would have boosted the number of people in the shop too much to be inconspicuous. Luckily, we had a plan b… as in b for Ben, the cassanova. Dressed sharply in a suit, Ben offered people down the Mall a tulip and asked if he could sing them a song. Plan B seemed great, but started off badly. The first few ladies he approached all rejected his tulip, and his song. So, he had to change tactic… and the first guy he approached loved it. From there we serenaded a few more people, and finally sang for the great staff at Cibo, Rundle Mall. Special thanks goes out to Barnaby (and his huge effort with the $9 trenchie), Heidi and Leticha, Chris and Daniel, and of course, all the people who were sung to or cheered at the end of the songs. It was a fantastic afternoon out and I’m sure an event even Rick Astley would be proud of!